Recently at The Wedge, a fantastic pizzeria on Western Avenue in Oklahoma City, I custom-made a pizza (from their long list of yummy choices) with caramelized red onions, dried figs, roasted garlic “sauce” and arugula. Sound familiar? It was so good I had to recreate it at home. I made a quick whole wheat crust, used fresh figs instead of dried and went with home grown sweet onions instead of red. Better the second time around. On a side note, we took Ike with us and the restaurant graciously allowed him to sit on the side patio with us. Now, Ike is a country dog. He sees lots of cows, rabbits, squirrels, birds and the occasional coyote, but he rarely sees humans other than me and Kel. For some unknown doggy-brain reason, Ike took an immediate and intense dislike to our waiter, a man Kel and I found to be extremely nice and accommodating. Ike barked every time the poor man came within 10 feet of our table. Which can make serving someone a little tricky. It got bad enough that by the time the meal was over, another wait person came out to deliver the bill, saying that our waiter was “afraid of getting bitten.” Not to worry. Ike only bites when the bill is too high. Wrap the garlic heads in foil and bake at 425-degrees F for 45 minutes to one hour, or until the garlic is very soft and buttery. You don’t need oil to do this, by the way. Let cool completely before removing the paper and/or squeezing the roasted heads into a small bowl. Add 1 tablespoon olive oil and mash well with a fork. Set aside. Dissolve agave nectar and yeast in 1/2 cup warm water in a large bowl; let stand 5 minutes. Add flours, salt and thyme (if using) to the yeast mixture and stir until a soft dough forms. Turn dough out onto a lightly floured surface and knead for a few minutes. Add a little flour as you knead, but just enough to keep the dough from sticking to your hands. Place dough in a medium-sized bowl coated with cooking spray. Cover and chill for one hour or more. It will rise slightly in the refrigerator – but this chilling plus the single rise is what makes for a thin – and a quick crust. In a small bowl, combine the figs, maple syrup, vinegar and salt and pepper. Stir well to make sure the figs are coated. Set aside. Pour about 1/4 cup vegetable broth or water into a large skillet and heat on medium. Add the tamari and the onions and stir occasionally, letting the liquid cook off before adding more. Cook low and slow – caramelizing takes patience. Stir and keep adding small amounts of liquid until the onions are a nice golden color and become extremely soft. Now add the figs and let cook for about 5 minutes. You should have a nice, sticky mess of onions and figs. Take them off the heat and set aside until ready to assemble and bake the pizza. Place a pizza stone on a rack that has been positioned in the middle of the oven. Preheat the oven to 500-degrees F. Line the underside of a baking sheet with parchment paper (if you don’t have a pizza stone, you can bake directly on this; otherwise, use the baking sheet/parchment to help you transfer the pizza to the stone). When the oven nears 500-degrees F, remove the dough from the refrigerator and roll out to about 13″. Place the dough on the prepared baking sheet and gently pat the dough out to flatten it. Using a fork, prick the dough all over so that the crust doesn’t get “blisters” as it bakes. Spread the roasted garlic paste all over the pizza and slide the dough onto the stone and bake for 5 minutes. Carefully remove the pizza and place on a heat-proof surface (I transfer it back to the baking sheet). Spread the onion/fig mixture over the pizza and return to the oven for another 5 minutes, or until the crust is browned and crispy. Remove the pizza and transfer it to a cutting board (one that won’t melt…) and add a handful or two of fresh arugula. Slice and serve. You can make up the toppings ahead of time and store in the refrigerator until ready to use. LOVE the sweet and savory fig preparation. Strikes me as something that would be good on all kind of things, like crusty bread, salad, a spoon. Thanks for sharing! Annie, you make everything look amazing! I love figs on pizzas. This looks really great. I just want to munch on that leaf! Arugula is the best, isn’t it? Great photo and delicious recipe. I guess that would be a situation in which I would tip extra. Haha, right – he did get a pretty good tip. Oh Annie, this pizza was worth the wait! I have been in anticipation for at least a week now! Scrumptious. I kind of forgot I did the post – time has become a funny thing. I do think you’re right about dogs and reactions…I trust Ike’s instincts. But then, both Kel and I are horrible misanthropes so he’s just following our lead! So true…I trust the little guy’s instincts! Fabulous!!! 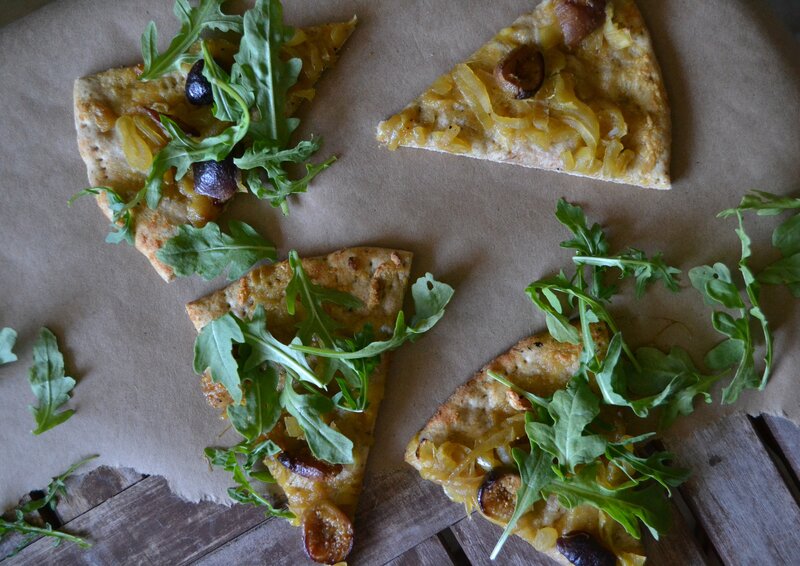 Love the combinations of caramelized onions and fresh fig, roasted garlic and Arugula – yummy!!! Anne, I have this tiny little Hibachi – and I confess I have no idea how to get it going! But I imagine pizza on the grill would be wonderful. Glamour food! Mmmm, pizza of any kind is my hands down, absolute favorite food. This looks divine. Maybe I can suggest it to my brother, who I’m visiting next week, who just sent me the, “So what can you eat?” email :P.
Oh, that kind of email ;-)! This crust is so easy, Bar! Figs on a pizza! What a cool & sweet idea! I love your pizza base too! This is a special layered pizza! I wouldn’t come up with those special ingredients all on 1 pizza: So good, so appetizing! I will make these beauties in September, when I have my own grown figs from my tree! Thank you so much for this lovely idea! 😉 I love it when you get all creative woman! Figs are one of my favorite pizza toppings, and I love the idea of the pizza being covered in a roasted garlic paste. This pizza sounds so heavenly! Thanks, Shira! Hehe, yes, best to eat either alone or make sure that one and all are partaking! Ahhhh! YUM! : ) If you ever open up a restaurant, we are so there! I have to incorporate fig into my recipes. This is so inspiring! Last week, we had an appetizer of stuffed figs lightly battered in cornmeal, pan fried and served with Balsamic. Heaven! Figs on pizza sounds divine. Oh wow – sounds fantastic! Figs marinating as I type. Not sure if I will put them on pizza or just toast. But the pizza looks incredible (and your photos here, with the light, color, lines – also incredible). I have my vegan dinner planned for the week now, thank you (again). In the “late to the party” vein (which I realize is late for this post, as well) – I made your/Somer’s Pit Paste today. First of all, it took about three minutes to make – second of all, it smells SO GOOD! My husband thinks it smells girlie, so I am going to try another batch for him with a little sandalwood or more eucalyptus or something in it – something ‘manly’ I guess 🙂 Anyway, thanks for leading me to that. You could do a lot with marinated figs! Let me know how you decided to eat them. Isn’t that pit paste amazing?? I’m so glad I tried it and it was so easy. I’m going to play around w/ the scent as well – boost the lavender and peppermint. Glad you tried it and glad it worked for you! Can you believe I have never caramelised an onion in my life! I’m going to have to try that on a pizza, it sounds wonderful, and your photos are utterly delicious! You haven’t lived, Lorna ;-)! This sounds so tasty! I love the combination of figs and arugula… even more so when they’re on top of a pizza! Delicious!! I love the toppings on this, especially the figs! What a unique idea. Ike is a good protector..I’m sure the waiter had an aura he didn’t like..poor guy haha. You totally had me at whole wheat pizza! I have an arugula plant that needs some trimming… problem solved.